OCEANSIDE, Calif., July 3, 2018 /PRNewswire/ To double sales closing rates, it pays to know how humans are hardwired for stories. "Your stories matter" is the message of the book Persuade With a Story! by persuasion expert Henry DeVries. "If you want the prospect to think it over, give them lots of facts and figures. If you want people to decide to hire you, tell them the right story. Storytelling helps persuade on an emotional level." In the last decade DeVries has authored, ghostwritten, and published more than 300 books for business. He is the CEO of Indie Books International. Formerly DeVries was the president of an award-winning Ad Age 500 marketing agency and assistant dean for continuing education at the University of California San Diego. In his research he has documented proven pragmatic strategies that can double sales results and achieve marketing returns of 400% to 2,000%. In workshops and keynote speeches he shares these strategies with thousands of business leaders each year. "Now any business leader or sales professional can easily use proven techniques of telling a great story employed by Hollywood, Madison Avenue, and Wall Street," says DeVries. One. Start with a main character. Every story starts with the name of a character who wants something. This is your client. Make your main characters likable so the listeners will root for them. To make them likable, describe some of their good qualities or attributes. Generally, three attributes work best: "Marie was smart, tough, and fair" or "Johan was hardworking, caring and passionate." Two. Have a nemesis character. Stories need conflict to be interesting. What person, institution, or condition stands in the character's way? The villain in the story might be a challenge in the business environment, such as the recession of 2008 or the Affordable Care Act (the government is always a classic nemesis character). Three. Bring in a mentor character. Heroes need help on their journey. They need to work with a wise person. This is where you come in. Be the voice of wisdom and experience. The hero does not succeed alone, they succeed because of the help you provided. Four. Know what story you are telling. Human brains are programmed to relate to one of eight great meta stories. These are: monster, underdog, comedy, tragedy, mystery, quest, rebirth, and escape. If the story is about overcoming a huge problem, that is a monster problem story. If the company was like a David that overcame an industry Goliath, that is an underdog story. Five. Have the hero succeed. Typically the main character needs to succeed, with one exception: tragedy. The tragic story is told as a cautionary tale. Great for teaching lessons, but not great for attracting clients. Have the hero go from mess to success (it was a struggle, and they couldn't have done it without you). Six. Give the listeners the moral of the story. Take a cue from Aesop, the man who gave us fables like The Tortoise and the Hare (the moral: slow and steady wins the race). Don't count on the listeners to get the message. The storyteller's final job is to tell them what the story means. "Nothing is as persuasive as storytelling with a purpose," says DeVries. "The right stories can work wonders whether you are using them in a one-to-one meeting, in a presentation that is one-to-several, or in a speech or publicity that is one-to-many. 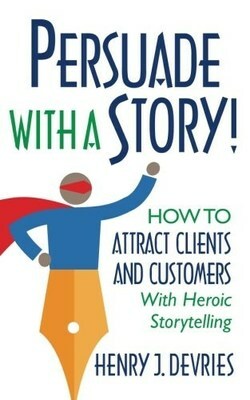 Start today to build an inventory of persuasive stories." "After you build an inventory of stories that demonstrate how you take clients from mess to success, you are then ready to deploy," says DeVries. "In storytelling, context is critical. Never randomly tell stories, but instead use stories at the right strategic times." Indie Books International (www.indiebooksintl.com) was founded in 2014 in Oceanside, California by two best-selling business authors. Since then the company has released more than 100 titles. Similar to indie film companies and indie music labels, the mission of Indie Books International is to serve as an independent publishing alternative for business thought leaders.